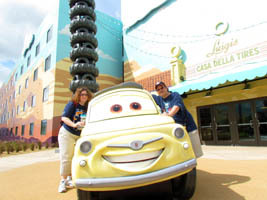 We stayed in the Radiator Springs CARS section at Disney’s Art of Animation Resort last week for the first public night (below, left). 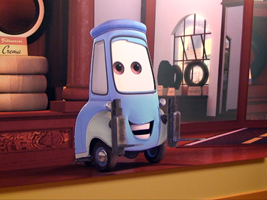 We were in the Luigi’s Casa Della Tires building – this is one of three guest buildings in this area. Guido (below, right) is on one of the pieces of artwork on the floors. 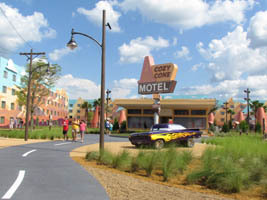 Please click HERE for all of our past coverage of this exciting new resort dating back to it’s beginnings as Disney’s Pop Century Legendary Years Resort. 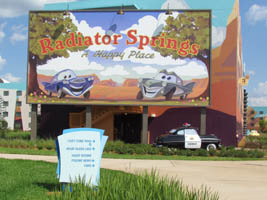 Radiator Springs at Disney’s Art of Animation Resort (below, left) is testing with Cast Members for a few days, we didn’t know that when we stopped by to have lunch! We spent a few hours taking photos and video of the newly opened area (official opening is June 18th), and we were very impressed with all the details we found.